Sofia Mayor Stefan Sofiyanski unveils a multi-purpose sports ground in Zone B5, a residential area in the capital. The Interior Department-Tetovo registered approximately ten shots, fired from a passing-by vehicle, one hour after midnight at the Nikola Tesla Street, near the town square and the post office. Series of rifle and sporadic shots were heard also from the Teke of Tetovo, from the unlicensed residential settlements in the area of the town's water supply system, the Stipska and Vonvardarska street, as well as from Rasadiste county near the Tetovo - Popova Sapka road. Some shots were registered overnight from the direction of the villages of Gajre, Lisec, Strimnica, Zelino, Prsovce, Slatina, Tearce, Palatica and Semsevo. Occasional infantry gunfire has been registered during Tuesday night in Kumanovo - Lipkovo region. As MIA reports, in the period from 21:00 hours until midnight, gunfire came from the area of the villages Vaksince, Matejce, Vistica, Grusane, Lojane, Slupcane, and Nikustak. In Lipkovo region villages patrolling of ethnic mixed police patrols continues without any problems. REGULAR SESSION OF THE GOVERNMENT. Today, the Macedonian Government adopted all draft-laws that come from the Framework Agreement except the draft for changes and supplements to the Law for passports. After the session, governmental spokesman Gjorgji Trendafilov said that additional consultations are needed for this draft, which would probably take place on Wednesday. "First of all this refers to the technical changes of the passports," he said. Trendafilov said that he could not say precisely in which direction would be the positions of the experts after the consultations in regard to this law. He rejected the alleges that the question about the language that would be used in the travel documents was already arranged among the leaders of the political parties of the Albanians, because, as he said, if that was the case there would not have been a need from additional consultations. He clarified that the three-lingual form of the passports was not yet defined. Asked if this law could put under question mark the other laws that were already arranged, Trendafilov said that all laws were individually reviewed and adopted by the government. According to the governmental spokesman, these laws would be submitted to the Assembly on Thursday, as planned. Regarding the forms for the census, Trendafilov said that the non-Macedonian population would use forms in the language it uses. At the Tuesday session, the government did not discuss on the announced strike of the employees in the public sector. The government, as Trendafilov said, discussed on the payment of the regress for the annual vacation, the draft-law for decorations and awards, and the draft-law for the rights of the persons prosecuted and imprisoned for the ideas for independence of the Macedonian nation. At its regular session, chaired by Prime Minister Ljubco Georgievski, the Macedonian Government discussed on and adopted Tuesday the Interior Ministry drafts for changing of laws on road traffic safety, interior affairs and personal documentation, which derive form the Framework Agreement. Today, the Government discussed on and adopted a draft for changing of the Law on census, according to which the census should be carried out on November 1-15, 2002. Changing of the Law will contribute to more successful completion of this procedure. According to this law, citizens may choose to register in the official Macedonian language and its Cyrillic alphabet or in another language, spoken by at least 20% of the citizens of Macedonia. If the census is carried out in an official language, spoken by at least 20% of the citizens of Macedonia, the registration form is fulfilled in that language and in Macedonian language and its Cyrillic alphabet. If the census is carried out in Turkish, Vlach, Roma and Serbian language, than data in the registration form are to be written according to citizen's wish and in Macedonian language and its alphabet. The draft is also in compliance with the United Nations recommendations that citizens of Macedonia, who have been out of the country for over 12 months, will be not included in this census. The draft will also provide for equitable representation of community members in bodies, in charge of the census realization, taking into consideration their professional skills. The Government discussed on and adopted the package of laws on the forthcoming parliamentary elections in Macedonia. A draft law on election of members of parliament proposes proportional model, professionalism in parliamentary service, structure of the election bodies, and new provisions that clarify the time periods and channels for filling and receiving replies concerning election complaints and appeals. The Government adopted the draft-laws on voter list and election districts in compliance with the suggested proportional model. The new election system is to be applied at the forthcoming parliamentary elections in the country. PRESS CONFERENCE OF MACEDONIAN AND SLOVAKIAN PRESIDENTS. Macedonian and Slovakian Presidents Boris Trajkovski and Rudolf Schuster assessed Wednesday in Bratislava that the political relations between the two countries are on a high level, without any open issues. According to MIA's special reporter, the two presidents stated at the joint press conference that Macedonia and Slovakia have not utilised all options for development of the economic cooperation, which according to them is on a very low level. In the mean time Macedonian and Slovakian Ministers of Economy Besnik Fetai and Lubomir Harach have signed the Agreement on Trade and Economic Cooperation, while the Macedonian Deputy Foreign Minister Muhamed Halili and the Slovakian Minister of Transport, Telecommunications and Posts Joseph Macejko have signed the Agreement on Air Traffic between the two countries. Slovakian President Schuster emphasized that his country supports the territorial integrity of Macedonia, adding that Slovakia has constantly granted support to Macedonia for handling the crisis. "Slovakia considers Macedonia as a friendly country, as it crosses the same road regarding the integration within NATO and EU," Schuster said, emphasizing that the two countries would share the experience in that respect in order to meet each other within these institutions. "We were assured that Macedonia supports Slovakia's admission as a non-permanent member of the UN Security Council," Schuster said, thanking for the support. Trajkovski confirmed the support, adding that he expects Slovakia to support Macedonia and its aspirations for gaining membership in the World Trade Organization, Central European Free Trade Association (CEFTA) and the Organization for Economic Cooperation and Development (OECD). He informed that the meeting also focused on the joint struggle against terrorism and organized crime. "Although the struggle is on multilateral plan, the bilateral cooperation is also necessary," Trajkovski said, adding that there is an option for cooperation on the security plan. Regarding the visa regime between Macedonia and Slovakia, Trajkovski said that it should be facilitated, as it is an obstacle for economic, cultural and scientific cooperation." Considering this issue, Schuster said that "sometimes Europe initiates the introduction of visas," which according to him "are not always well-intentioned." In that context, it was agreed to open Honorary Macedonian Consulate in Slovakia. Trajkovski met Wednesday afternoon with Chairman of Slovak National Council Jozef Migas. The meeting focused on the cooperation between the parliaments of the two countries, especially the assembly commissions on foreign policy. Regarding the promotion of the economic cooperation, Trajkovski and Migas pointed out the necessity of signing the agreements on protection of investments and avoidance of double taxation. In the honor of Macedonian President Boris Trajkovski, his host Schuster would organize a reception this evening, at which the heads of the two states would exchange toasts. MACEDONIAN FM CASULE'S ADDRESS AT EAPC MEETING IN REYKJAVIK. Macedonian Foreign Minister Slobodan Casule addressed Wednesday at a regular ministerial meeting of the Euro-Atlantic Partnership Council (EAPC) on NATO adjustment and its influence on the partnership process. Casule presented the experience of Macedonia-NATO relations in the last few years, as new forms of cooperation that would contribute to further upgrading of the Euro-Atlantic Partnership process. 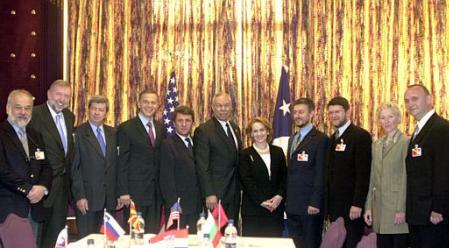 At the meeting, chaired by NATO Secretary-General George Robertson and attended by US State Secretary Colin Powell, Casule said that by new forms of cooperation, the world would be able to face the challenges and to take strong action against threats it has been facing since September 11, 2001. Macedonia confirmed its determination to work for stability and peace in the region and therefore should be invited to become full-fledged NATO member at the Alliance's Summit in Prague, Casule said. Today, Casule attended a ministerial meeting of the Vilnius group member countries, at which Powell reiterated Washington's determination for robust NATO enlargement at the Prague Summit in November. Presenting Macedonia's achievements that make the country a solid candidate for NATO member, Casule said that the membership would also contribute to strengthening of stability and security of the Southeastern Europe and to realizing of the idea for united Europe. Casule also had bilateral meeting with Robertson, Italian Prime Minister and acting Foreign Minister Silvio Berlusconi, and with his Greek, Albanian, Croatian and Slovenian counterparts George Papandreou, Arta Dade, Tonino Picula and Dimitrij Rupel. Official Version: Empty Shells, Not Shrapnel Hit the Injured. The members of the police special unit "Lions" had a tactic military exercise Wednesday morning in Leunovo village, in Gostivar area. The representatives from NATO, OSCE and several embassies as well as the Macedonian Minister of Interior Ljube Boskovski observed the exercise. However, at the end of the exercise, Minister Boskovski tried to fire from heavy weaponry and several persons were injured due to recklessness. The incident happened when the empty shells of the weaponry scattered around, injuring the journalist of "Dnevnik" daily Daniela Veljanovska and three employees from Gostivar police department. According to MIA's correspondent, the attendants did not obey the order of Lieutenant Bobi Utkovski to observe the exercise from a distance. Director of the Public Security Bureau General Goran Mitevski said that "the Interior Ministry regrets the incident, although the exercise was well performed." NATO representative Tom Metcalf also expressed regret over the incident, adding that such accidents could happen during the military training. Interior Minister Accidentally Injured Four Persons. 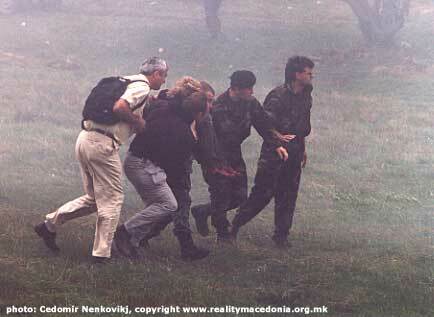 Minister of Interior Ljube Boshkovski wounded four persons during Lions' tactical exercise in Mavrovo. The accident casualties include a journalist, a translator, and two government employees. Minister of Interior Ljube Boskovski firing the light artillery mortar popularly known as froggy. 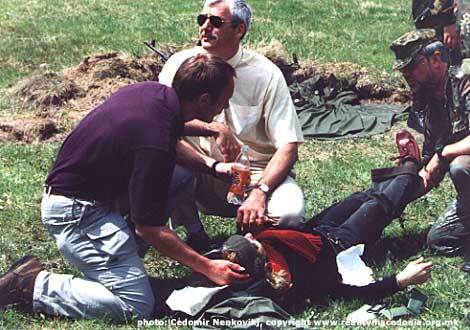 Minister of Interior Ljube Boshkovski wounded four persons during Lions' tactical exercise in Mavrovo (see bellow). The accident casualties include Daniela Veljanovska, Dnevnik journalist, a French translator, and (allegedly) two advisors to the Prime Minister. Daniela Veljanovska was wounded above the left eye. 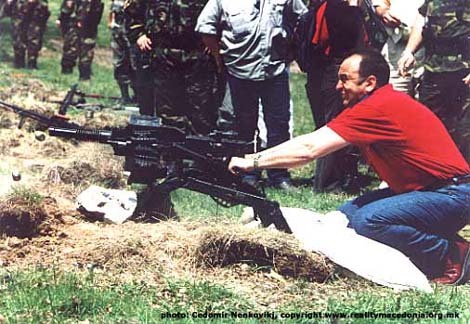 Field sources reported that Minister Boshkovski displayed his shooting skills with various armament: a machine gun ("sharec," pictured in the top image of this article) and mine launcher (froggy) picture and info at the bottom of this Croatian page). Some of the shrapnel ricochet from nearby rocks and hit the victims. A1 TV reported that the Minister expressed deep sorrow because of the accident and announced that he'll bear the full responsibility. Macedonian Police Aviation Unit Bell 212 helicopter immediately transported the victims to Skopje Military Hospital. The Minister of Police took responsibility of his actions, after the incident. The wounded have been transported by police helicopter to the Military Hospital in Skopje. According to Colonel Utkovski, Chief of the Military Hospital, the three wounded have suffered minor injuries which are not life-threatening. Daniela Veljanovska transported to the police helicopter. Diplomats and representatives of the International Community had an urgent meeting with the Prime Minister, Ljubcho Georgievski, in the Government Building today. They have asked for the resignation of the Minister Boshkovski. The Chief of the Macedonian Diplomacy, Slobodan Chashule, who is attending the NATO meeting in Iceland, called the Minister of Police, Ljube Boshkovski, today asking for his resignation. Dnevnik editor-in-chief Branko Gerovski announced a suit, and the Association of Journalists demanded Minister's resignation. 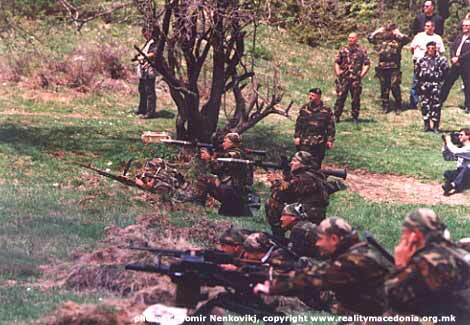 The military excercise in the area of Mavrovo. Macedonia: Lions to conduct tactic exercise. Skopje, 15.05.2002. (Makfax) The members of the rapid reaction force Lions will conduct today tactic exercise near the village of Leunovo, Mavrovo region. Leading figures of the Interior Ministry and representatives of the international political factor in Macedonia, as well as a number of prominent personalities and politicians will attend the exercise. Parvanov Wants Refugees' Realties from Ankara. 'The Balkans are not to be referred to as a 'powder- keg' any more, but be rather considered as inseparable part of Europe,' Turkey's President Ahmed Nejdet Sezer said at the inauguration of the trilateral meeting of the heads of state of Bulgaria, Turkey and Romania in the Turkish resort of Cesme yesterday. During the 45-minute conversation Bulgaria's President Georgi Parvanov has posed the issues on sealing a readmission contract, reunion of separated families and restitution of the realties to the Bulgarian refugees from the Aegean Thrace. The Turkish part insisted on payment of pensions to the migrant ethnic Turks. Bulgaria's President stressed that the work of the joint commissions, working on the issues together with the Foreign Ministry, should become more active. BULGARIA - PRESIDENT - BACK FROM SUMMIT. Sofia, May 15 (BTA) - President Georgi Purvanov will request information from the Foreign Ministry on the progress of the Bulgarian experts in the Bulgarian-Turkish working group on bilateral property, social and humanitarian issues, the head of state said Wednesday, back home from the Fifth Trilateral Summit Meeting of the Presidents of Bulgaria, Turkey and Romania which took place in the Turkish resort of Cesme. Conferring with Turkish President Ahmet Sezer, Purvanov raised on behalf of the Bulgarian side, "as categorically as relevant," the issue of reuniting divided families, signing a readimission agreement and restituting the immovable property to Thracian Bulgarians. "The working group must be activated, it is most appropriate that the experts should identify the right balance and suggest an option that would be mutually acceptable to both parties," the head of state said. Within the forum, Purvanov pressed for equitable raising of the issue regarding the fate of Pan-European Transport Corridors IV, VIII and IX, which are of interest to all three countries. Purvanov expressed satisfaction with the support for the Bulgarian position on the interconnection of the three countries' power grids and with Romanian President Ion Iliescu's backing for the idea that Bulgaria become an energy centre of the Balkans. Presidents of Turkey, Bulgaria, Romania Adopt Joint Declaration at Cesme Meeting. Cesme, Turkey, May 15 (BTA) - The presidents of Turkey, Bulgaria and Romania reiterated their support for furthering cooperation between their countries in the process of achieving full membership in the European and Euro-Atlantic structures, reads a joint declaration which they adopted Wednesday at a meeting in the Turkish resort of Cesme. Presidents Ahmet Sezer of Turkey, Georgi Purvanov of Bulgaria and Ion Iliescu of Romania discussed NATO's enlargement, focusing on Bulgaria and Romania's bids for membership. They voiced their firm belief that NATO's southeastward enlargement will provide the Alliance with new military opportunities and will ensure strategic depth for a more efficient fight against terrorism and nonmilitary threats such as organized crime in its all forms, reads the document which the Bulgarian president's press center offered BTA. The presidents said they expect that Bulgaria and Romania will be extended invitations for full membership at NATO's summit in Prague. They agreed that in this decisive moment when European security is reshaped, Southeastern Europe's accession to NATO will promote the overall security and stability in the continent. The three presidents stressed the importance of sustained development in Southeastern Europe for lasting peace, cooperation and good neighbourly relations. They voiced their readiness to assist the efforts to "rationalize" the Stability Pact and to support its role as an important instrument in the development of regional cooperation and for the political, economic and social development of Southeastern Europe. The three heads of state noted the need for a more serious commitment on the part of the international financial institutions in the implementation of specific projects. Purvanov, Sezer and Iliescu voiced their satisfaction with the successful process of democratization of FR Yugoslavia, as well as with the November 2001 elections in Kosovo and the establishment of self-government institutions. The presidents reiterated their support for the sovereignty, territorial integrity and inviolability of the borders of the Republic of Macedonia and voiced their satisfaction with the signing of the Framework Agreement in August and the adoption of the amendments to the Constitution envisaged in the Agreement. They hailed the passage of the local self-government and amnesty laws as positive steps. The next Bulgarian-Turkish-Romanian summit will take place in Romania in 2003. Colin Powell: Conditions for NATO's Big Bang Enlargement Better Than Ever. Reykjavik, May 15 (BTA special correspondent Petko Azmanov) - The conditions for a "Big Bang" enlargement of NATO are better than ever, US Secretary of State Colin Powell said here on Wednesday, meeting with the foreign ministers of the Vilnius Group of countries. NATO enlargement in light of the results of Tuesday's meeting of the North Atlantic Council, the contribution of the applicant countries to the fight against terrorism, and their preparation to join NATO were discussed at the meeting on Wednesday. Powell thanked the Vilnius Group of countries for the support they are giving the US in the fight against terrorism in implementation of the commitments made in Sofia last year to act as de facto allies of the US in the anti-terrorism campaign. Powell confirmed President Bush's firm position that the Prague Summit must make a decision on a "Big Bang" enlargement of NATO, adding that the conditions for this were better than ever. He called on the applicant countries to keep up the pace of their preparations for membership, bearing in mind that even greater efforts would be needed after the Prague Summit to face the greater responsibilities and new ambitious tasks in the context of NATO's adaptation to the dynamic processes and challenges in the security area. Powell assured his counterparts that the US and the majority of the member states held that the invitations in Prague would not contain additional conditions or differentiate between the invited countries. At the meeting, Bulgarian Foreign Minister Solomon Passy called cooperation within the framework of the Vilnius process "very successful". Such an approach would be useful in the context of EU enlargement as well, he said. He briefed the participants on the good results and prospects of NATO-related cooperation among Bulgaria, Romania, Greece and Turkey, which began in February. Passy said the timely formulation prior to the Prague Summit of a decision about the countries that will be invited would help the applicant countries concentrate on their preparation and avoid unnecessary tension. Italy Supports the Principle of Equality of All EU Candidate Countries and Speeding Up Negotiations with Bulgaria. Reykjavik, May 15 (BTA) - Bulgarian Foreign Minister Solomon Passy conferred with Italian Prime Minister and Foreign Minister Silvio Berlusconi within the framework of the meeting of foreign ministers in Reykjavik. The two discussed possibilities for intensifying Bulgarian-Italian relations, the press office of the Council of Ministers said. 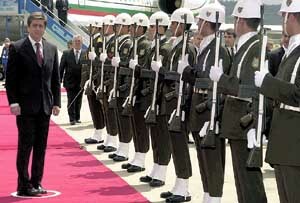 The Italian Prime Minister confirmed Italy's support for Bulgaria' bid to join NATO. Berlusconi also declared this support at the session of the foreign ministers of the NATO countries on May 14. The two sides also discussed the progress in the accession of new countries to the European Union. Berlusconi reiterated Italy's support of the principle of equality of all candidate countries and of speeding up negotiations with Bulgaria. Solomon Passy: Bulgaria Will Continue to Contribute to Balkan Security. Reykjavik, May 15 (BTA special correspondent Petko Azmanov) - In the wake of the tragic events of September 11, NATO has clearly demonstrated its ability to adapt to the dramatically changed security situation, Bulgarian Foreign Minister Solomon Passy said in Reykjavik on Wednesday. He participated in a discussion on NATO's adaptation and its impact on partnership, held within the framework of the meeting of the Euro-Atlantic Partnership Council. Bulgaria was among the first countries to react as de facto NATO allies and is resolved to pursue this policy, Passy said. The decisive issue now is not whether NATO can respond to the new security situation, but how effectively and quickly it will do so. "NATO's adaptation should be viewed in the context of the process of globalization, and no matter what complications and problems arise, NATO's vitality will depend on our ability to adequately answer the challenges to security worldwide," Passy said. Passy called for further differentiation and adaptation of the partnership schemes to the new challenges, as well as for adequate levels of the resources allocated for defence. If the difference in military capability between the US and the other NATO member states keeps growing, the very essence of the Alliance will be threatened, Passy said. "As an applicant for NATO membership, my country is fully aware of the ensuing responsibilities. That is why we allocate over 3 per cent of GDP for defence spending and will continue doing so in order to develop and maintain our capacity to be an effective ally and contribute to security, both in our region and in the anti-terrorist campaign," Passy said. He reaffirmed Bulgaria's position that the biggest possible enlargement in Prague would be the best answer to the new realities in global security, politics and economics. Politically, this enlargement would mean restoring European unity. It will also have an economic impact by creating a stable and secure environment for investment and sustainable economic development. In terms of security in Southeastern Europe, a "Big Bang" enlargement of NATO will fill the security void between Central Europe and NATO's southern flank, thus giving the Alliance new geostrategic advantages in the anti-terrorist campaign and the expansion of stability to the neighbouring regions, Passy said. Passy identified the deepening of the regional approach as another major instrument of NATO's adaptation. He cited as an example the successful cooperation between Bulgaria, Romania, Greece and Turkey in the form of quadrilateral dialogue, involving two member states and two applicants. Football: Levski Wins 23rd Bulgaria Cup after Beating CSKA 3-1.
after beating all-time rival CSKA 3-1. Scorers: 1-0 Dalibor Dragich (in his own net), 1-1 Konstantin Golovskoy, 1-2 Georgi Ivanov, 1-3 Peter Kabat. There were some 20,000 in the stands. BULGARIA - IRAN - CUSTOMS COOPERATION. Bulgaria, Iran Sign Customs Cooperation Accord. Tehran, May 15 (BTA) - Bulgaria and Iran will coordinate their customs control activities, says a bilateral agreement on mutual customs assistance which was signed on Wednesday, said the National Customs Agency with the Bulgarian Finance Ministry. The document was signed by the Director of the National Customs Agency Asen Asenov and by Masoud Karbasian, Deputy Minister of Economic Affairs and Finance and President of the Islamic Republic of Iran Customs Administration. Under the agreement, the parties will take measures to facilitate the movement of goods and people and relax customs formalities, and joint actions to prevent customs offences. Asenov was received by Iran's Economic Affairs and Finance Minister Tahmasb Mazaheri and by Roads and Transport Minister Ahmed Khoram. UDF Politburo Excommunicated Peter Stoyanov. UDF leader Nadejda Mihailova hid from journalist. Yesterday, the UDF National Executive Council (NEC) did not distance themselves from the accusation against Peter Stoyanov, which UDF Deputy Leader poured over the ex-president. A day earlier he claimed that the former head of state was ready to back the ousting of Ivan Kostov in the latter's capacity of the PM. UDF leader Nadejda Mihailova hid from journalists immediately after the yesterday's sitting of NEC. UDF spokesman Nikolai Mladenov was not able to elaborate on the fact whether the NEC supported the idea that Stoyanov was detrimental to UDF. He, however, was explicit that the UDF leadership accepted Sougarev's statements as undoubtable facts. Ex-president Peter Stoyanov was not available to comment on the criticisms levied on him. He has to come back from the USA on May 28. Stoyanov was expected in his capacity of a former UDF member to be the leading figure in the consolidation of the right-wing political space in Bulgaria. Mayor of Bourgas John Kostadinov reproached the cabinet for having no respect for his opinion concerning pivotal issues of the city and the region in an official letter to the Prime-minister. The mayor insists on a personal meeting with Simeon Saxe-Coburg-Gotha to discuss their future relations and to decide the way they are to make decision. He insists the cabinet to take into consideration his opinion about the Bourgas-Alexandroupolis oil pipeline, the enlargement of Port Bourgas and the Bulgarian National Bank activities. Kostadinov demands the municipal budget to be increased. POPE - VISIT - APOSTOLIC NUNCIO. Pope Will Encourage Bulgarians to Be Proud of Their Identity, apostolic Nuncio Says. Sofia, May 15 (BTA) - "When he comes to Bulgaria, the Holy Father will tell all Bulgarians that under no circumstances has he ceased to love the Bulgarian people, and that his coming here is yet another clear sign of this love," Apostolic Nuncio in Sofia Antonio Mennini says in an interview with BTA. This is his answer to a question about the view of the Holy See on the alleged "Bulgarian connection" in the 1981 attempt on the Pope's life. Immediately after the tragic incident, Pope John Paul II apparently felt forgiveness towards the physical perpetrators, Monsignor Mennini says. "The Holy See never expressed any position on the proceedings in the case, allowing the investigative authorities to do their job," he says. When the Pope addresses Bulgarians here on May 23-26, 2002, he "will encourage them to keep alive the memory of their cultural, ethical and spiritual roots, to be proud of their national identity (in which the Christian faith is a major element), and to remain committed to their calling to serve as a 'bridge' between Eastern and Western Europe, thus contributing to the building of the common European home," Mennini says. "By visiting Bulgaria on the Day of Slav Letters and Bulgarian Culture, May 24, the Pope will, in a way, return the regular visits of Bulgarian delegations to the Vatican made at this time of the year. This gesture shows the Pope's respect for Slav culture in general and for Bulgarian culture in particular," Monsignor Mennini says. "The current relations between Bulgaria and the Holy See are characterized by tacit great respect and two-way cooperation. The Catholic Church in Bulgaria feels itself as a worthy and inalienable part of the cultural and spiritual tradition of the Bulgarian nation, and it has been recognized as such," he says. The full transcript of the exclusive interview with the Apostolic Nuncio is published in the issue on Pope John Paul II of BTA's "100% series." Veliko Turnovo (Northern Bulgaria), May 15 (BTA) - Theologians of Bulgaria, Greece, Romania and Serbia are discussing the state and prospects of Eastern Orthodox education in the Balkan countries. The forum was organized by the Balkan Orthodox Youth Association, the Eastern Orthodox Theological Department of the Sts Cyril and Methodius University in Veliko Turnovo and the Mitropolitanate of Veliko Turnovo. Innovations in pedagogy which can be applied in teaching religion such as role and didactic games and dramatizations, and freedom and restrictions to the creativity of teachers in Eastern Orthodoxy are in the focus of the discussions. Participants in the forum will visit and discuss religion classes in schools in Veliko Turnovo. Religion classes should be compulsory from the first to the eighth grade so as to exercise control over the spread of nonconventional religions and different Christian and Islamic sects, according to the theologians of the Veliko Turnovo University. Their studies show that children from the fifth to the eighth grade prefer religion to be taught from a cultural, historical and philosophical point of view. They are also interested in the history of the different religious communities. Deutschebank Doesn't Bid for Bulgartabak. Within a week it will be clear how we shall sift the offers, says vice-PM and Minister of Economy, Nikolay Vassilev. Deutschebank hasn't backed up any of the bidders in the tender for "Bulgartabak", said spokesman for the German bank, Dr. Detlev Ramsdorf. Thus he disproved the information that this prestigious bank is behind one of the participants in the tender - "Tobacco Capital Holding". The NMS is to suspend the downsizing of teachers if the Ministry of Education has no legal grounds for it, said Plamen Panayotov, Chairman of the NMS PG, in Shoumen yesterday. He pledged to personally check the case and that measures will be taken immediately for the things not to be brought to court. Panayotov made his statement after Mayor of Shoumen Vesselin Zlatev said that the 10-percent downsizing of teachers is violating the now enforced enactments. To the mayor, the decision of the MoE could be contested in the Supreme Administrative Court. M-Tel Opened Modern Office in Stara Zagora. New modern business office of M-Tel opened doors in Stara Zagora yesterday. CEO Roumiana Kyuchukova and Ivan Georgiev - deputy-mayor of the town, inaugurated the business center. The offices of the first GSM-operator in this country are already over 120, 18 more will be opened before the end of the year. M-Tel will invest over $200 million till end-2002 in modernization of the infrastructure - building of new telephone exchanges and bases, Kyuchukova reminded. The company will win another international recognition in May. The Trade Leaders Club in Madrid will award the company the 'Gold Badge for Quality'. Bulgarian mobile operator is already a laureate of the 'World Prize for Quality - 21st Century of the International Marketing Organization'. The International Monetary Fund praised Bulgaria's reformist government on Tuesday for accelerating privatisation, a key pledge under a three-year deal with the Fund. The government of Prime Minister Simeon Saxe-Coburg, which took over last July, signed a $300 million loan with the IMF last year and in return pledged to boost reforms in one of the poorest candidates for European Union membership. "We were pleased to hear about the progress in a number of areas, especially in enterprises' privatisation and other economic reforms," IMF's mission chief for Bulgaria Jerald Schiff said after meeting Economy Minister Nikolai Vassilev. Schiff, who is in Sofia to scrutinise Bulgaria's performance, told reporters that achieving high and sustained economic growth was the main objective of the IMF and the government. Completing a long-delayed privatisation process and key structural reforms were vital for growth, the IMF has said. The cabinet, whose economic team is led by young, western- educated reformers, has won respect among foreign investors for its ambitious agenda to spur growth, uproot corruption, reduce a high debt burden and sell remaining state assets transparently. "Even before completion of big sell-offs, privatisation revenue has reached 220 million levs ($102 million) for the first three months of this year, which means that by September we will exceed the target for the full year," said Vassilev. The privatisation plan of the government forecast minimum revenue of $300 million from sell-offs this year to be used mostly to cover a widening current account deficit. Biggest revenue is expected from the sale of telecom monopoly BTC and tobacco monopoly Bulgartabak, due to be privatised around mid-year. Bulgaria aims to complete privatisation by early 2004 when some 95 percent of the assets earmarked for sale should be in private hands. Schiff also said IMF supported Bulgaria's plans to gradually reduce income and profit taxes by 2005 in a bid to boost growth and investment, while keeping another key pledge to the the Fund of low budget deficit by raising excise duties and other taxes. Two Compete for Post of No.1 Custom Officer. Present acting director, Assen Assenov stands the best chance. Two candidates will compete for the post of the new chief of the Customs Agency, told "Standart" sources from the Ministry of Finance. The rivals for the job are now acting director of the agency, Assen Assenov, and Ljudmil Anastassov, who was a deputy of Emil Dimitrov for a short while. Another contestee will be Christo Koulishev, ex-chief of the Agency under the BSP rule. According to sources of "Standart", Assen Assenov has the best chances to head the Customs. He is a career customs officer and is referred to as a real expert. He was born on January 27, 1961 in the town of Radomir. He graduated from the prestigious Institute of Foreign Relations in Moscow and has master's degree. In 1991, immediately after graduation, he took up a position in the customs. He was appointed an acting director of the Customs Agency on February 20, 2002 after Emil Dimitrov had resigned from the post. "Coat" Can Save Small Reactors. Decommission of Units 1 and 2 of the NPP will keep at bay sticklers, says Krassimira Ilieva. 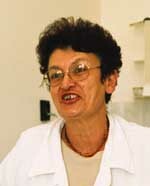 Krassimira Ilieva is a senior research officer at the Institute of Nuclear Research and Nuclear Power with the Bulgarian Academy of Sciences from 1985 on. For a decade already she is working on the safety of the reactors of Kozloduy NPP. - Mrs. Ilieva, in your estimation how long will the small reactors of the Kozloduy N-plant live? - Our research shows that Unit 1 can be safely used till 2005-2006, and Unit 2, till 2012-2013. Unit 3 can be exploited till 2014. Unit 4 has stopped neutron emission and there's no limit for it. - Then why they insist on their decommission? - The main claim is that they don't have a "coat" to cover them like the reactors of the new generation. As for Unit 4, though, long ago a special system was installed there which is a safe substitute for it. Currently a similar system is being installed in Unit 3. We could also cover up Units 1 and 2. Having in mind that there are technical means which could substitute the "coat" one may hope that even sticklers could be kept at bay. To me it's evident that the small reactors are not dangerous. - Have we lost Units 1 and 2 for good, could they be put to use again? - They could be modernized to meet the safety requirements set to Bulgaria. - What are the costs of such reconstruction for one unit and how long would it take? - In rough estimation it would cost around 100 million levs. N-plant in Kozloduy could afford it. The reconstruction may be completed within several months. - The report of the IAEA gave very negative assessments to the performance of the Bulgarian nuclear power regulation body (Committee for Peaceful Use of Atomic Energy - CPUAE). Could this be the reason why the EU doesn't believe in the safety of our NPP? - The CPUAE must be independent from the political authorities and its competence has to be enhanced. - Does it worry you that our energy strategy doesn't set any concrete terms or aims as regards the development of nuclear power industry? - What worries me is the fact that this sector has no clearly defined statute, there is no decision whether the N-plant in Belene will be built. I have the impression that now the preference is given to gas power industry. Israelis Claim Hundreds of Taliban Operate in Bosnia. "Bosnia and Herzegovina is a Moslem country in the heart of Europe and it is connected with fanatical Moslems," the parliamentary Deputy in Israeli Parliament Joseph Tommy Lapid said in an interview with Zagrebs daily Jutarnji List, adding that several hundreds of Taliban are operating in Bosnia. "Bosnian Ministry of Foreign Affairs addressed a demarché to Israel regarding my statement, however, we are well aware of the ties between this country and the Moslem extremists," said Lapid. The Representative in Israeli Parliament reckons the misunderstanding between the Bosnian Federation and Israel could trigger an increase in credible threats.